A significant body of research indicates that when parents participate in their children’s education, the result is an increase in student achievement and an improvement of students’ attitudes. Productive partnerships between schools, family and the community also provide a strong network of connections for new families and students to our school. Winters Flat students are currently enjoying the fruits of labour provided by a group of passionate school supporters, lead by school parent Drew Marshall. 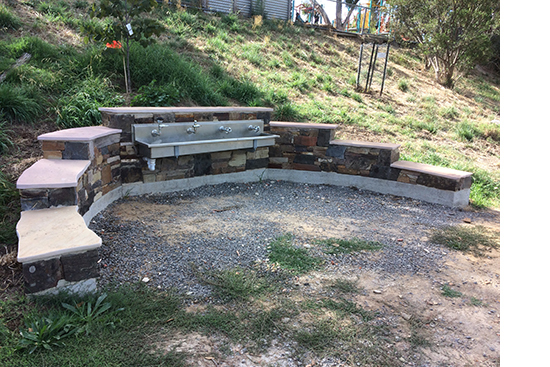 Drew used his considerable local network to design a beautiful stone semi-circle feature, housing drink bubblers for students to use during sports sessions at the school oval. The bubblers were funded by prize money won in 2016 at Bendigo’s Healthiest School Award. The student health leaders decided the prize money would best be spent installing the drink bubblers and work began late last year. The school community, especially the students, would like to thank Drew for his amazing work and generosity. Drew spent many a weekend designing, sourcing and building the stone work and plumbing for the bubblers. Winters Flat families have been working together with The Friends of Campbells Creek along the "school" section of the creek for many years. This year we produced nesting boxes for local birds and mammals, as well as continued improving existing vegetation in the area and planting indigenous species to improve the local habitat. 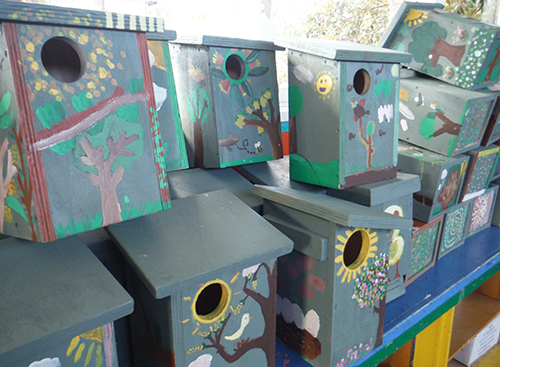 The students painted the boxes which were then installed at a special community planting day. Additionally, each term we run parent information seminars or topics such as resilience and anxiety. Held in the Winters Flat kitchen, these information sessions are presented by our Wellbeing Councillor Kim Collins, and are are open to parents from our school, and other schools in the area. For more information on school community events, check the events calendar, or join our Facebook online community.